We are happy that Prof. Nir Davidson form the Weizmann Institute of Science spends six weeks with us in Bonn. We thank the Alexander von Humboldt Foundation for its generous support. Dr. Andrea Alberti wins the Rudolf Kaiser Prize 2017. Since 1989, the prize is awarded every year by the Rudolf Kaiser Foundation to a young researcher that has distinguished herself/himself in the field of experimental physics. The benefactor, born in Nuremberg in 1923, has been for many years president of the Federal Patent Court in Germany before he obtained in 1979 the habilitation (Habilitation) at the TU München in the field of experimental physics. Since then, Rudolf Kaiser has devoted himself to the support of young researchers in the field of experimental physics. This year the awarding ceremony will be celebrated on April 20th, 2018, as part of the “Physikalisches Kolloquium der Universität Bonn”. Colleagues and friends from the University of Bonn are cordially invited to the academic cerimony (download the program). Dr. Carsten Robens wins the BMBF prize "Quantum Futur-Award" for the best PhD thesis in the research area of quantum technologies. With his PhD thesis, which was defended in February 2017, Carsten Robens has taken a step closer to realizing a quantum computer with neutral atoms. The core result of his work is a new method to control single atoms depending on the internal spin state, which enables an unparalleled control of the position of atoms in so-called polarization synthesized optical lattices. The ceremony has been celebrated at the Universität Stuttgart on March 22nd, 2018 in the framework of the "Quantum Futur-Akademie" (more details here). Quantum technologies are one of the booming research areas of the present days. Since a few years, it is not anymore just about fundamental research questions, but also, and especially, about tangible technological applications, which rely directly on quantum mechanical principles such as superposition states and entanglement. To know more, you can read the interview (in German) with Dieter Meschede speaking about the future of quantum technologies, with particular focus on tap-free communication. 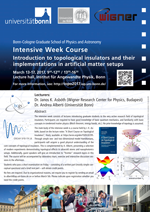 The main body of the intensive week is a course held by J. K. Asbóth, based on the lecture notes “A Short Course on Topological Insulators”, freely available at https://arxiv.org/abs/1509.02295. Through simple one- and two-dimensional model Hamiltonians, participants will acquire a good physical understanding of the core concepts of topological insulators. This is complemented by A. Alberti, presenting a selection of modern experiments demonstrating topological effects in ultracold atoms and nanophotonics setups. Additionally, guest speakers will give an introduction to “frontier” research topics in this field. The course will be accompanied by laboratory tours, exercise and interactive discussion sessions in the afternoon.